Aboard the 48-foot 'Biba Bon', 'Pasa Bon' or 40-foot 'Vista Mar' dive boat. Includes: tanks,weights, fruit and beverage. See schedule for days and times. Two Tank Morning Dive $82.00. 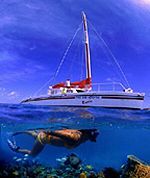 One Tank Afternoon Boat Dive $52.00. Divers Companion as passenger on selected dives $20.00. 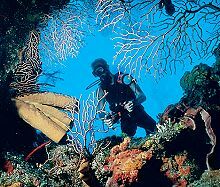 As snorkeler, including equipment $30.00, Equipment Rental per day $30.00. Equipment can also be rented separate at $10.00 per item.